Automatic pill dispensers are affordable and effective medication management solutions that are designed to improve medication adherence to levels over 90% (Source). They are engineered with ease-of-use in mind and typically feature friendly and simple interfaces for elderly individuals (Source). These pill-dispensing tools make it easy to manage even the most complex medication regimens, enabling seniors who live on their own to stay on track with their prescription meds (Source). Some automatic pill dispensers even feature monitoring services. Those who subscribe are enrolled in 24-hour monitoring, which increases compliance dramatically. It is AC powered with battery backups in case power goes out. The way it works is that pills are loaded into the medication tray with each of the different 28 active compartments possessing a 20 aspirin-sized tablet capacity. 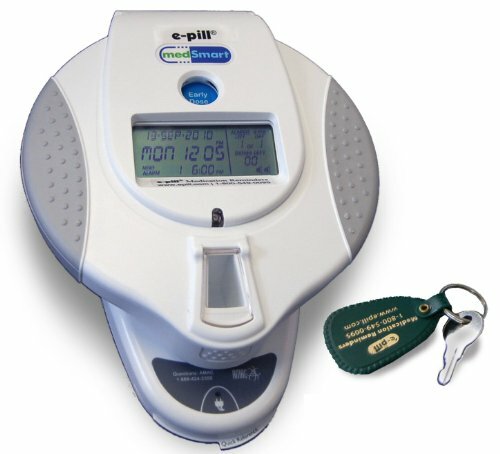 Buyers that we interviewed say that this is a reliable and excellent-quality pill dispenser that you can program for between 4 to 30 days at a time, depending entirely on the frequency of doses. For example, because it has 28 compartments, one user says that she supplies 5 doses a day for five days at a time using these 28 compartments. Another buyer that we spoke to applauds its particularly deep medication compartments, compared to other models on the market. 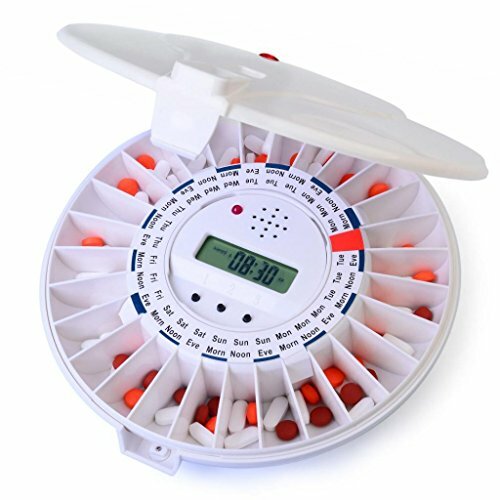 One word of caution- it is a good buy only if the person taking the medicine is able to remember what the alarm signifies, is able to actually get the medicine out of the dispenser, and who are likely to take the pills right after removing them from the e-Pill. Another buyer that we spoke to says to supplement the automatic pill dispenser, she installed signs above the machine telling the patients to take their medications immediately after the alarm goes off. This helps increase compliance. As well, other users report coaching their patients and loved ones about how to open and use the machine- picking it up off the cradle, emptying the medication dose into their hand, and then putting it back into the charging port cradle. Other users in general endorse the spaciousness of the medication compartments, the ease of programming, the long battery life, as well as the flawless operation of the time programming. One big negative that a user observed is that it is not completely tamper-proof. They say that if you pry the bottom with a knife, apply a little pressure, the medication compartments can be pried open. If you will be using this pill dispenser with for a patient who is prone to tampering, this may not be the best option for you. 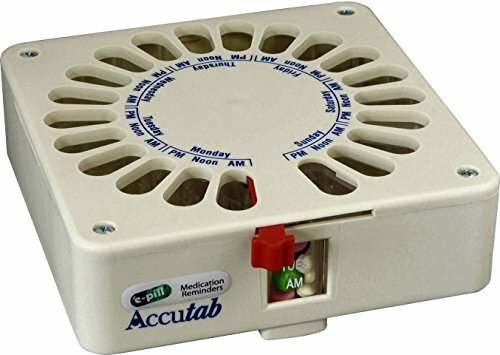 You can check out the bulkier Accutab Pill Dispenser as an alternative. That said, let's take a look at some automatic pill dispenser reviews and help you choose the best pill dispenser for you or your loved one. 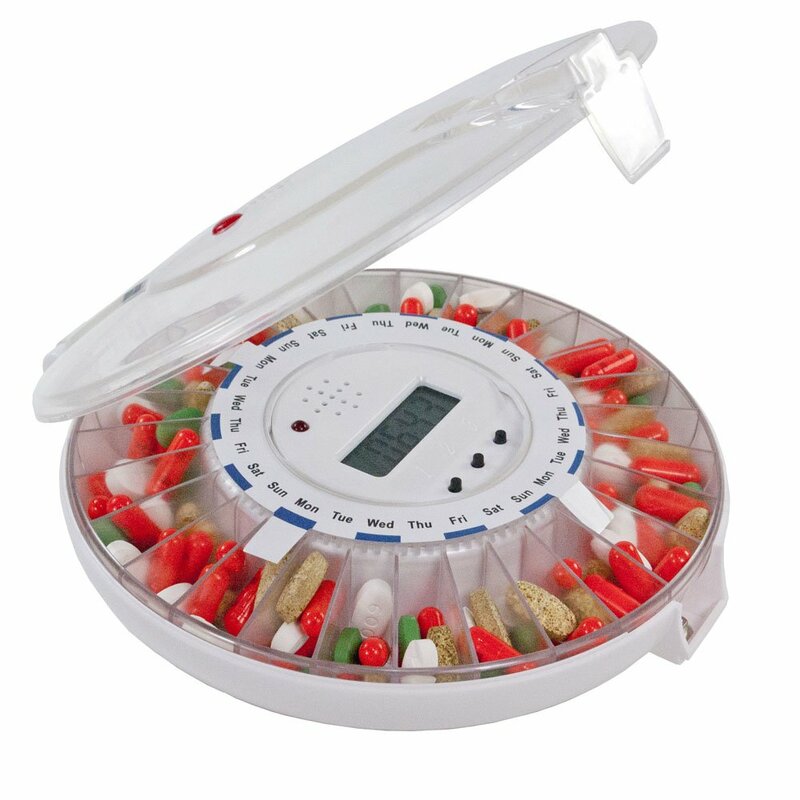 Manage your loved ones’ medications without hassle with the help of this quality automatic pill dispenser. It is easy to use and set up and comes with customizable alarm and reminder times. Caregivers, seniors, people suffering from memory problems and even ordinary people with a complex medication regimen can benefit from this pill dispenser. Features include six daily alarm options with a loud sound and blinking light. For improved safety, it is equipped with a barrel key locking system. In case of battery power loss, customized settings are retained in the memory. With this dispenser, users will be able to take the right medication at the right time. When administering the right medication at the right time becomes too challenging, this battery-operated pill dispenser will come in handy. It is designed to have 28 sealed compartments that can hold up to 12 pills. The compartment also has interchangeable discs for dispensing a particular medicine up to four times daily. For overdose protection, it comes with a safe lock and key feature that prevents anyone from accessing the medicines outside the prescribed times. The schedule for dispensing medicines can be set to up to 4 weeks in advance. When it’s time to take the medication, the 30-minute buzzer and red flashing light will come off. Overall, it is a great product for safely monitoring medications. Simplify medication administration by using this pill dispenser that has a total of 21 large compartments in all. A majority of the users we spoke with praised it for the intuitive design that makes it easy to install under a kitchen or medicine cabinet. When the slide lever is rotated, the medicine will fall right into the hand of the user. It can be used for dispensing multiple doses of several medications in a day. Since it does not come with an alarm system, you can purchase one separately. While some users noted that it is hard to use with gel pills as they tend to stick to the sides, many find this product of good value. This GMS Med-e-lert It is ideal for people who need to take regular medications. It comes with 6 dosage rings for customizing the dosage settings. There are also 28 slots for medications on its removable pill tray. The alarm and blinking light can be customized to go off at any time when a medication should be taken. After 10 minutes, the display will automatically shut off to save battery life. This dispenser is battery operated, completely portable and is ideal for caregivers. To reduce the chances of overdosing, it comes with a tamper-proof locking system and a custom barrel key. This fully automatic locked medication dispenser has been assigned exceptionally high marks by the user base we spoke with. It is easy to set up and use and comes equipped with a blinking light and an alarm system that will not stop until picked up. The alarm can be set to sound up to 6 times daily. To prevent unauthorized access, it is lockable with 2 keys included. A total of 28 active compartments can accommodate up to 20 aspirin-sized tablets. Added accessories include an AC powered docking station, large compartments and rubber grips for users with dexterity problems. Users comment that their elderly parents feel a great deal more independent since they have begun using their automatic pill dispensers. People that have purchased automatic pill dispensers also enjoy how deep the compartments are, which makes it easy to add a large number of pills into them. Many of the automatic pill dispensers also come with templates that are designed for different dosage schedules. For instance, two times a day, three times a day etc. Amazon users also comment that their units have saved them a tremendous amount of money- because they do not need to hire somebody, a caregiver, for instance, to monitor their parent’s medication adherence. The pill dispensers also typically feature sturdy locks that discourage tampering. This is important when the elderly have dementia or Alzheimers and can become confused, perhaps prompting them to try to access medication they are not scheduled to take. These automatic pill dispensers also feature early dose options, so that patients are able to take one dose to bring with them if they are going out somewhere. Loud and audible alerts are great for hearing impaired patients. In addition, these pill dispensers frequently feature sound settings that enable different tones for different hearing levels. Visual alerts are also a common feature of some automatic pill dispensers, which is another great way to ensure that the hearing-impaired is here to their medication schedule. Most users recommend using the charging station and rechargeable batteries to ensure that the device is always activated. One user on Amazon describes having to call her mother who suffered from dementia twice a day to remind her to take her pills. After purchasing an automatic pill dispenser, she is able to load two weeks worth of pills into the dispenser, set the clock for the appropriate times and she is now able to rest comfortably knowing that her mother is taking her pills correctly. If you are responsible for taking care of an elderly individual, you are likely aware that monitoring and managing their medication is a crucial component of ensuring their long-term health. 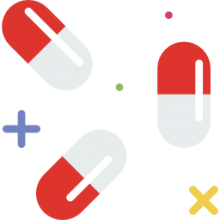 Medication management describes the ongoing management of an individual’s medication regimen, ensuring that they are taking all of their pills at the right time and that they are not suffering any interactions or other types of complications. If the individual you are caring for, whether it be a senior citizen, your grandmother, your grandfather or an elderly parent, many people suffer from chronic illnesses that require a great deal of medication to manage. As we age, we may begin suffering from arthritis, dementia, fibromyalgia, Alzheimer’s disease and a range of other debilitating illnesses that physicians have a laundry list of potent medications they prescribe. A dedicated caregiver will likely utilize an automatic pill dispenser to help them with their medication management strategy. In order to have a coherent medication management strategy, you or the caregiver should be focused on ensuring that all medications are being used appropriately, documenting the appropriate dosages, and in general creating a dynamic and comprehensive list that effectively tracks all the medications the senior in your life is consuming. It can be helpful to write these out on a legal pad or even to store them in the cloud using something like Google Sheets or Google Docs so that you and other family members, or the caregivers you employ, can have access to them in one dynamic format. You should also spend a good deal of time researching for drug interactions that can be harmful to your loved one. There are some excellent websites that are useful for this purpose. While most physicians are aware of these interactions, when an elderly person begins taking a complex assortment of different medications prescribed by different doctors the potential for error increases exponentially. If certain medications need to be consumed with food, this is also another component of medication management is sometimes left on considered. If you are utilizing something like Google Sheets to document all of the pills that your loved one is taking, make sure that there is a row or a column that you create for notes that can help to describe specific components of each medication. Thankfully, many pharmacies have tracking systems that will alert a pharmacist about potential interactions. Sometimes the best way of maintaining medication compliance is to have a frank and open discussion with your loved one. If your loved one is of sound mind, you can sketch out a process for ensuring that everyone is on the same page regarding their medication and how the system will reinforce the required behaviors to ensure that all of the pills are taken correctly. WebMD recently reported on the top 10 prescription medications in terms of the number of monthly prescriptions. It’s an interesting list- and particularly relevant to the elderly population, as well as the American population at large, which is broadly relying more and more on prescription drugs for all manner of medical and psychiatric conditions. According to WebMD, the thyroid drug Synthroid has become America’s most-prescribed medicine. However, Humira, which deals with a range of ailments, had the greatest sales, based on the medical research company IMS Health. The company published information on the top one hundred medications and product sales from April 2014 through March 2015. Synthroid (levothyroxine), which usually deals with hypothyroidism, or hypothyroidism illness, continues to be the highest-prescribed medication for several years. Humira (adalimumab), which helps to treat ailments like joint disease and Crohn’s disease, bested the previous year’s top-seller, which was Abilify (aripiprazole). Investigating these medical devices has convinced us the enormous benefits of these devices. If you are a caregiver for an elderly person in your life, consider investing in one of these products. It will likely make your eldercare relationship easier to manage.